This listing is for a really unique Megaman DIY arm gun blaster set. Want to see it in action? Simply watch the video above, although please keep in mind that the frame rate of my camera doesn't do it justice. By following a very basic two minute assembly process, you can have this circuit working for you very quickly out of the box. The boards were assembled and programmed in-house. The idea here is that if you are DIY'er, and you want to make an electronic arm gun for Halloween or for any costume party for that matter, you can place this electronic set into your own costume creation! Megaman is one of my favourite Capcom games. Well, the series is, I mean. I still play Megaman 2 all of the time, because it is without a doubt my favourite in the series. The Megaman charge sound comes from Megaman X. 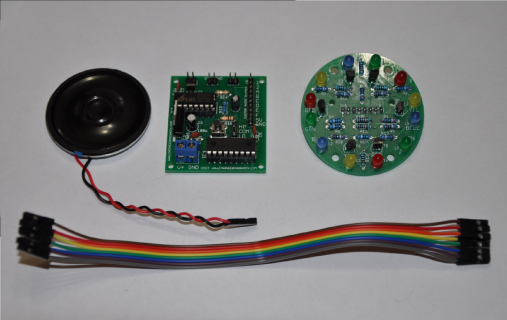 This set comes with a 1W 8 Ohm speaker, an LED scroller board that interfaces with the included controller board. All you need is a few minutes to connect it all together, and a power supply. That and, of course, your own costume making ingenuity! While this set does not come with an AC adapter, if you are on of those people who want to make an arm gun for decoration, and display it for people, you can ask to purchase a 9v 1A adapter for me for an additional $6.50. It is an easy connection to make to the main board The below video shows you how to put it all together! When the board is powered, but is not actually "Charging/Shooting", the board consumes less than 1mA. However, when you fire, the board requires about 450mA until the shot is taken. Then, the set automatically goes back into standby mode. If you want to make this into an arm gun, you will need at least 1x 9v Duracell or Energizer battery. Preferably two or three, as 9v batteries aren't good for sourcing current. If you place said batteries in parallel, you will get a circuit that can blast many, many, many times before the batteries die. The money spent on shipping will ensure that your packaged and shipped via post air from Ontario Canada. If you want overseas shipping, I will have to invoice you for a slightly larger amount. Please let me know if you have any questions. I can accommodate faster shipping request if you want to pay the difference. If you have any questions at all, please do not hesitate to ask! Below is the assembly video. It will show you how to put it together. Thanks for looking!